Should You Sell Northgate Minerals Right Now? Should you sell Northgate Minerals (AMEX: NXG) today? Today I'm laser-focused on Northgate Minerals, ready to evaluate its price, valuation, margins, and liquidity. Let's get started! As you can see, Northgate Minerals is down from its 52-week high. If you bought near the peak, now's the time to think back to why you bought it in the first place. If your reasons still hold true, you shouldn't sell based on this information alone. Northgate Minerals is having no trouble maintaining its gross margin, which tends to dictate a company's overall profitability. This is solid news; however, Northgate Minerals investors need to keep an eye on this over the coming quarters. 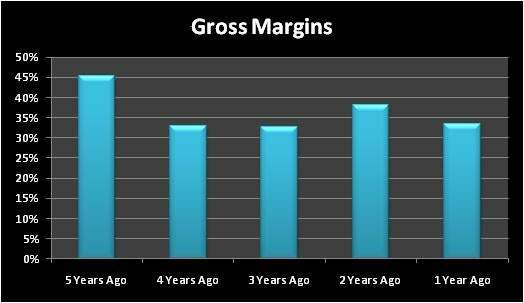 If margins begin to dip, you'll want to know why. Next, let's explore what other investors think about Northgate Minerals. We love the contrarian view here at Fool.com, but we don't mind cheating off of our neighbors every once in a while. For this, we'll examine two metrics: Motley Fool CAPS ratings and short interest. The former tells us how Fool.com's 170,000-strong community of individual analysts rate the stock. The latter shows what proportion of investors are betting that the stock will fall. I'm including other peer companies once again for context. The Fool community is rather bullish on Northgate Minerals. We typically like to see our stocks rated at four or five stars. Anything below that is a less-than-bullish indicator. I highly recommend you visit Northgate Minerals' stock pitch page to see the verbatim reasons behind the ratings. Here, short interest is at a mere 3.9%. This typically indicates few large institutional investors are betting against the stock. Now, let's study Northgate Minerals' debt situation, with a little help from the debt-to-equity ratio. This metric tells us how much debt the company's taken on, relative to its overall capital structure. Northgate Minerals has been taking on some additional debt over the past five years. 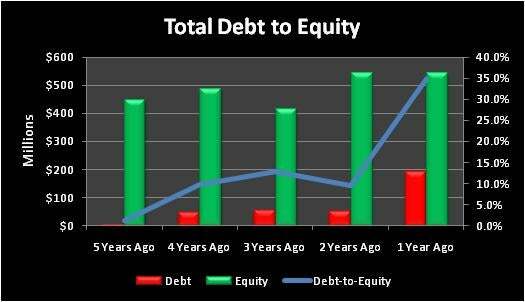 Even with increasing total equity over the same time period, debt-to-equity has increased, as seen in the above chart. Based on the trend alone, that's a bad sign. I consider a debt-to-equity ratio below 50% to be healthy, though it varies by industry. Northgate Minerals is currently below this level, at 35%. The last metric I like to look at is the current ratio, which lets investors judge a company's short-term liquidity. If Northgate Minerals had to convert its current assets to cash in one year, how many times over could the company cover its current liabilities? As of the last filing, Northgate Minerals has a current ratio of 2.51. This is a healthy sign. I like to see companies with current ratios equal to or greater than 1.5. Finally, it's highly beneficial to determine whether Northgate Minerals belongs in your portfolio -- and to know how many similar businesses already occupy your stable of investments. If you haven't already, be sure to put your tickers into Fool.com's free portfolio tracker, My Watchlist. You can get started right away by clicking here to add Northgate Minerals. Northgate Minerals has failed only one of the quick tests that would make it a sell. This is great, but does it mean you should hold your Northgate Minerals shares? Not necessarily. Just keep your eye on these trends over the coming quarters. If you haven't had a chance yet, be sure to read this article detailing how I missed out on more than $100,000 in gains through wrong-headed selling. Is Golden Star's Stock Cheap or Expensive?